Hollyhocks, also known as Alcea rosea or Althea, are biennial flowering plants native to China that self-seed so abundantly, they appear as perennials. Gardeners value the short-lived plants for their large, single or double hibiscus-like flowers that bloom in midsummer to early fall. Blossoms are borne on tall, upright flower stalks in shades of white, yellow, pink, red and purple, depending on variety. Hardy in USDA hardiness zones 3 through 8, hollyhocks require only minimal maintenance to thrive in most areas of the country once established, although they are susceptible to foliage rust. Plant hollyhocks during spring or summer in a location that receives full sunlight throughout the day. Choose a planting site that consists of well-drained, rich, fertile soil for optimal growth. Space hollyhocks 18 to 36 inches apart. Water when the top 3 to 4 inches of soil begin to dry out, about once every five days. Decrease watering frequency to once every 10 days during winter. Apply water directly to the soil to minimize the chance of disease. Feed hollyhocks once every two months using a low-nitrogen 5-10-10 NPK fertilizer. Do not fertilize during winter, when the plant is dormant. Apply at the rate recommended by the manufacturer's directions for the best results. Apply a 3-inch layer of mulch to the soil surrounding hollyhocks during mid-fall to insulate the soil through winter. Begin the layer of mulch about 3 inches from the base of the plant to allow air circulation. Remove the mulch after the final frost of winter. Pinch off faded or dead hollyhock flowers to prolong the blooming season and encourage the formation of additional blossoms. Sever the flowers at their point of origin to reduce damage to the plant. 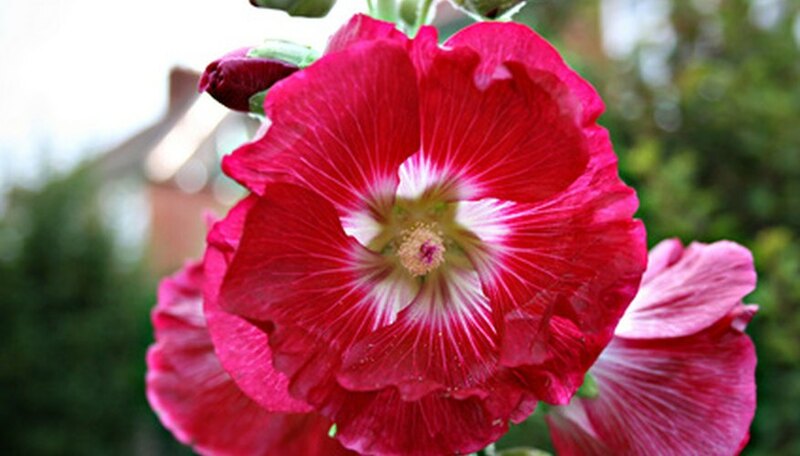 Grow hollyhocks in partial shade, if necessary, although they will not bloom as profusely.